News: Presenting the Arnold & Son HMS Beagle Set. Limited Edition of Eight Sets of Three timepieces each. Continuing with their limited edition product strategy, this time Arnold & Son presents a trio of timepieces commemorating Charles Darwin’s voyage of discovery. The HMS Beagle Set is composed of eight limited edition sets of three timepieces each, honoring the HMS Beagle ship that was used by Charles Darwin to set foot at the Galapagos Island. While the HMS Beagle undertook three survey voyages in all, it was the second one, with naturalist Charles Darwin on board, that guaranteed its place in history. With this set of three watches, each featuring an exquisite hand-painted miniature of HMS Beagle, Arnold & Son pays tribute to one of the most celebrated ships in the history of exploration. The Beagle’s second voyage is best known for a five-week stopover in the Galapagos Island, which gave Charles Darwin the foundations for his theory of evolution. The voyage’s express purpose, among other things, was to establish a chain of linked reference points with known longitudes that could be used by future navigators to set their chronometers precisely. For this purpose the ship carried an unprecedented 22 marine chronometers, five of which were by Arnold and associates. The large number of timepieces was necessary because of inevitable malfunctions and imprecision, when a collection of chronometers guaranteed better average values. Philippe Boven, of Arnold & Son, explains the reason for a unique limited edition set that will appeal to collectors and connoisseurs alike: “John Arnold and his son made an enormous contribution towards the development of the marine chronometer, so honoring HMS Beagle with this set seemed a fitting tribute.” The set comprises three timepieces each with a different Arnold & Son in-house movement: the HM ref. 1LCAW.S08A.C111W, with the ultra-thin A&S1001 movement with over 90 hours of power reserve; the TB ref. 1ARAP.W08A.C120A, with the self-winding A&S6103 movement with integrated true beat seconds system; and the UTTE ref. 1UTAR.S07A.C120A, featuring the ultra-thin tourbillon calibre A&S8200 with a one-minute flying tourbillon and over 90 hours of power reserve. The movements are housed in 18-carat white gold, 18-carat rose gold and 18-carat red gold cases, respectively, with black alligator straps. 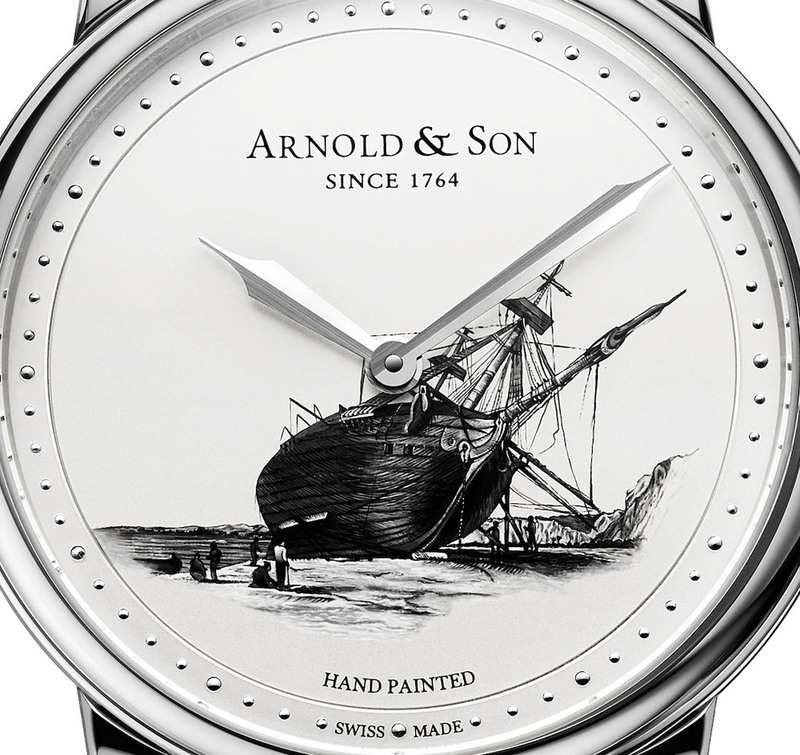 A feature common to each of the watches is a finely detailed, hand-painted miniature showing HMS Beagle at some stage of its second voyage. Set against silvery-white and silvery opaline dials, the paintings are based on illustrations of the ship taken from documentation of the voyage. The art of painting miniatures by hand calls for infinite patience and consummate skill. The tiny brushstrokes and texture gradually build up entire images with an astonishing richness of detail and underscore Arnold & Son’s mastery of the decorative arts. The magnificent HMS Beagle timepieces are available in a limited edition of just eight sets of three watches each. Case: 40 mm 18K White Gold. Exclusive Arnold & Son mechanical movement, hand-wound, 21 jewels, diameter 30 mm, thickness 2.7 mm, power reserve over 90 hours, 21,600 vph. Dials: hand-painted miniature, silvery-white and silvery Opaline. Crystal: cambered sapphire with anti-reflective coating on both sides, display case back, water-resistant to 30 meters. Case: 44 mm 18K Rose Gold. Exclusive Arnold & Son mechanical movement, self-winding, ceramic ball bearing, 30 jewels, diameter 30.4 mm, thickness 7.79 mm, power reserve over 50 hours, 28,800 vph. Functions: hours, minutes, true beat seconds. Case: 42 mm 18K Red Gold. Posted on July 14, 2014 by Editor & Publisher and filed under Arnold and Son, News and tagged Arnold & Son HMS Beagle Set Calibre A&S6103 Calibre A&S1001 Calibre A&S8200 HMS Beagle Charles Darwin.